This handsome caterpillar had the misfortune to be feeding on a branch of a non-native shrub (Allamanda sp.) in my Cranbrook garden when I lopped it off (the branch, not the caterpillar). From the photograph it was identified as the larva of a species of Australian hawkmoth, probably Psilogramma increta. Click to enlarge the photo and you will see it has a strange horn-like structure at its tail-end (left). This looks rather like a sting but is quite harmless and as far as I can discover its purpose is unknown. (My theory is that it is a “fake sting” designed to warn off predatory birds). In this photo the caterpillar’s head, at right, is curled over and busily munching! 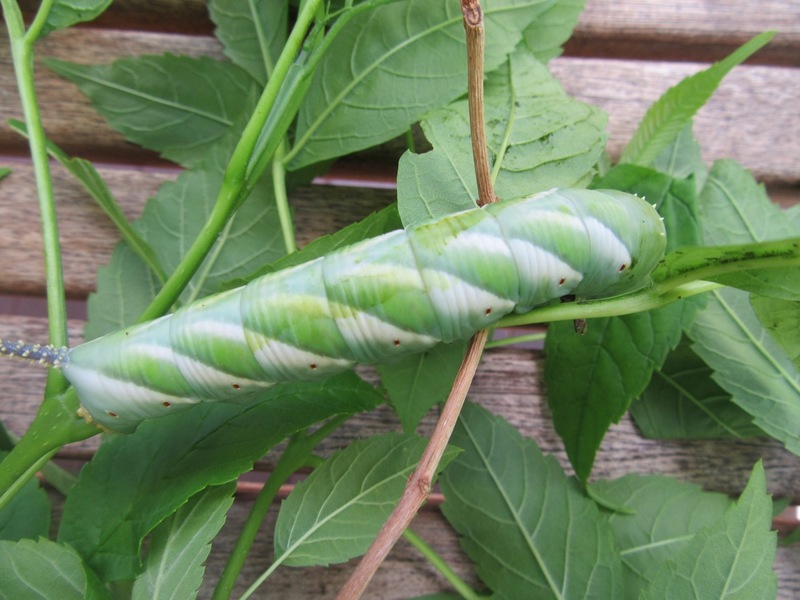 Hawkmoth caterpillars burrow into leaf-litter or soil in order to pupate and, after a few days of feeding on fresh Allamanda leaves in a specially prepared box, this is what seems to have happened. I am unwilling to disturb it by probing beneath the surface of leaves and soil and I have no idea how long I might have to wait before I discover whether I provided the right conditions for its metamorphosis to succeed. The Museum suggested it might be “a few weeks”. I will let you know! 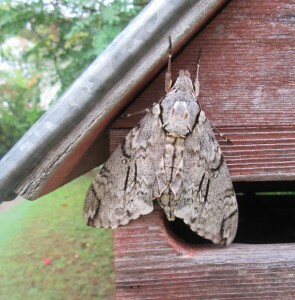 By coincidence, a couple of weeks earlier an adult hawkmoth had spent most of the day attached to my mailbox, undisturbed by the postie’s visit with a bundle of Christmas mail. This was unlikely to be the ‘parent’ of my caterpillar and might well have been a different species (either Psilogramma menephron or P. casuarinae) - all are in the Sphingidae family. Detailed examination is usually required in order to distinguish between several look-alike species. My thanks go to Malcolm Tattersall and the Queensland Museum for suggested IDs and other information. Both also referenced this website which has a wealth of information and photographs of moths, butterflies and their caterpillars. Have something in your backyard you’d like to share with us? Please tell us about it. If you can send a photo, so much the better, but this is not essential.